Details: Full color, 128 pages; TPB; 6 1/2" x 9"
Crimefighters Empowered and Ninjette struggle with a superhero community fatally inflamed by rampant romance, courtesy of the passion powers of embittered ''magical-girl'' The Soldier of Love. If she prevails, love is toast! 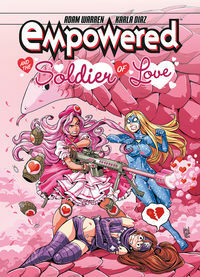 Collects Empowered and the Soldier of Love #13 plus Adam Warrens ''Pew! Pew! Pew!'' Empowered one-shot. * Art by webcomic superstar Karla Diaz and Adam Warren! * Over 150,000 Empowered graphic novels in print! Legal Notice: Entire contents trademarked (® or TM) and copyrighted (©) 1986-2019 by Things From Another World, Inc. and respective copyright and trademark holders. All rights reserved. Page rendered at 2019-04-19 12:01:28 in 0.220 seconds.